The finance minister had clearly broken away from the convention of presenting a “Vote on Account” by presenting a full-fledged budget. However, the budget was in expected lines. 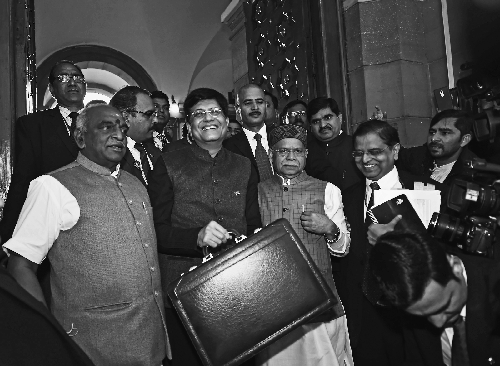 It is an election year budget with announcements to please its specific vote banks - farmers, middle class, labourers, etc., Most part of the budget speech was dedicated to what has been achieved in the last 5 years and promising a new India by 2022. To cater to the needs of the Hindi heartland, the finance minister had delivered most part of his speech in Hindi to directly reach out to its electorate there. The budget had something for everyone. There is a new programme namely “Pradhan Mantri Kisan Samman Nidhi” that provides a direct income support of Rs. 6,000 per year to all small farmers holding upto 2 hectares of land that too effective December 1, 2018. This will entail an annual expenditure of Rs. 75,000 crore every year. There will be a transfer of Rs. 20,000 crore in the current fiscal much before the elections. This is clearly aimed at addressing the huge rural distress, which costed the ruling establishment three states in the Hindi heartland in the recent by-elections. For the middle class there is a full tax rebate for income upto Rs. 5 lakhs, increase in standard deduction from Rs. 40,000 to Rs. 50,000, increase in threshold for TDS, and benefit on capital gains tax on residential houses of upto Rs. 2 crore. There is also increase in limit for gratuity and ESI, which will benefit the salaried tax players to a larger extent. A new pension scheme was also announced for unorganised labourers. The announcement related to simplification of direct tax system is welcome. With 99.54 per cent of the returns being filed online today, the focus on 24-hour tax refunds and complete electronic scrutiny for all returns filed in the next two years is a welcome move to reduce tax terrorism which every honest tax payer face today. The finance minister thanking all the honest taxpayers in his speech will encourage more people to participate in the nation building. Interestingly, there was also announcement on creating a “Rashtriya Kamdhenu Aayog” to upscale sustainable genetic up-gradation of cow resources and to enhance production and productivity of cows. The finance minister also gave a glorified review of movie “Uri” during his speech. These are clearly aimed at its core “Hindutva” voters. Even the articulation of “ten dimensions” to create a ten trillion dollar economy in 2030 to a large extent resembles the “India Shining” campaign of NDA in 2004. The film fraternity which met the prime minister recently also got some goodies in the form single window clearance for ease of shooting films and amendments in Cinematograph Act to control the menace of privacy. If all these results in increase in fiscal deficit to 3.4 per cent, so be it. The biggest challenge for the economy today is lack of jobs, slower growth in the economy, lack of capital investments, rural distress and balance sheet problem of the banks. The budget does not address any of these issues. The revenue targets assumed for both direct and indirect taxes for next year seems to be aggressive with little increase in capital spending by government. With private sector showing reluctance in spending more on capex there is a need for government to step in to kick start the economy. The biggest let down by the government is lack of aggression in disinvesting PSUs. The key slogan of the government “Minimum government and Maximum governance” still remains a slogan as there is no significant improvement in ease of doing business on the ground. Any entrepreneur in private will vouch this point. As Bill Clinton once said, "It’s the economy, stupid”. The key issue before the electorate today is the lack of jobs and lacklustre economic growth. There is distress all around. Farmers, middle class, SMEs all were impacted one way or another. The economy is still struggling to recoup from the twin impact of demonetisation and GST. While demonetisation was a big blunder, the GST was very poorly implemented. This government had missed a golden opportunity in the last five years that too with an absolute majority. The budget is a clear acceptance by the government of its mis-managing the economy in the last five years and hope the last minute goodies in the budget will sail them through in the elections. Only time will tell whether this strategy worked on the ground or not.